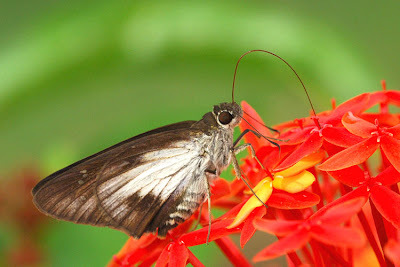 Skippers, which belong to the family Hesperiidae, derive their popular name from their rapid and darting flight of most species. 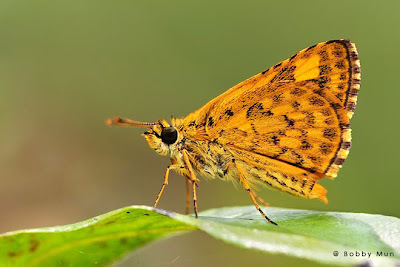 Globally, there are about 4,000 recognised species of Hesperiidae with the greatest numbers and diversity occurring in the tropical regions of Central and South America. Species from only the sub-families of Coeliadinae, Hesperiinae and Pyrginae are found in Singapore comprising a total of 53 species currently identified. A male Cephrenes acalle niasicus feeds on the flower of Periwinkle (Vinca sp.) 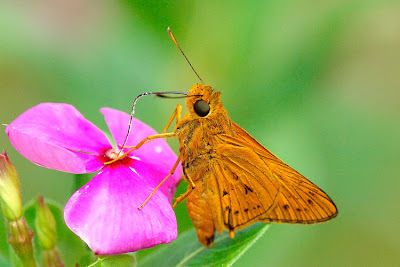 Note the pollen on the skipper's proboscis where its feeding habits help in the pollination of the plant. Males of many species possess a patch of scent scales on the forewing, called a stigma, useful in attracting females. Males may also have a folded portion of the forewing on the leading edge, called a costal fold, which encloses scent scales. 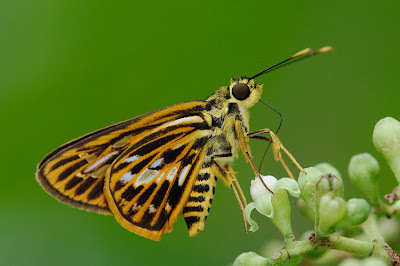 The skippers also possess many structural features which set them apart as a more 'primitive' group with close affinities amongst moth families. Many species of Skippers bask in the sun with a unique posture, the forewings being open only half way and the hindwings open fully. 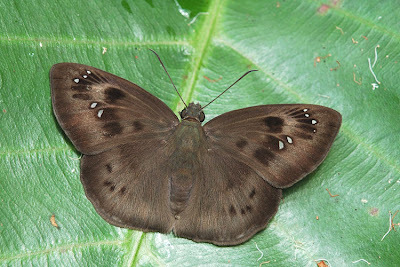 They dart around at very high speeds and often return to their favourite perches to adopt a characteristic pose unique to this family of butterflies, where their forewings are only partially open, whilst their hindwings are opened flat. A typical unique Skipper pose - forewings held half opened at an angle, with the hindwings opened flat. 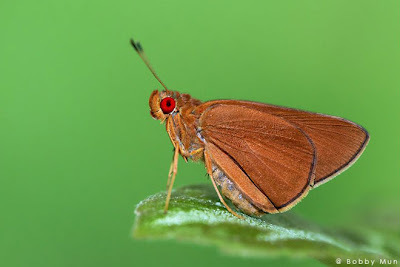 In a number of species of Skippers, the proboscis is exceptionally long, and often up to more than twice the length of the butterfly's body. 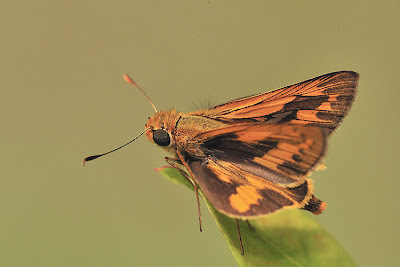 Many species of skippers are crepuscular (occurring during the twilight hours of the day) whilst others fly in the early dawn hours and disappear by 9:00am in the morning, only to be active again at dusk. This Hoary Palmer (Unkana ambasa batara) extends its exceptionally long proboscis and probes it deep into the flower of Ixora sp. to extract the nectar from within the flower. With few exceptions, the larvae of the subfamily Hesperiinae feed on monocotyledons e.g. mainly grasses, palms and bamboos, whilst those of Coliadinae and Pyrginae feed on dicotyledons. Eggs are smooth, or sometimes ridged and white or red in color. Larvae are cylindrical with a large head. They are usually green or transparent green and sometimes conspicuously marked. The larvae feed within cells made out of rolled or folded leaves and pupation occurs inside the cell. The pupa of many species are covered with fine white powder. When disturbed, the caterpillars and pupae of several species react with rapid vibrating movements which would startle a would-be predator. A Common Snow Flat (Tagiades japetus atticus) in its typical pose of perching on a leaf with its wings opened flat, a characteristic of the Sub-Family Pyrginae. 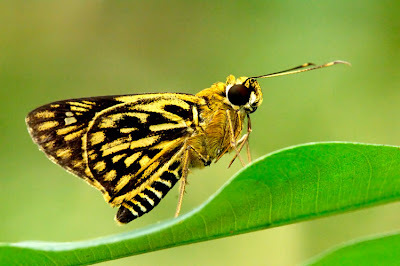 Skippers found in Singapore are generally drab coloured - dark brown, orange with spots and indistinct markings on their wings. Many are small sized and often fly close to the ground. Some species "puddle" - i.e. feed on animal or bird droppings as well as damp forest paths. 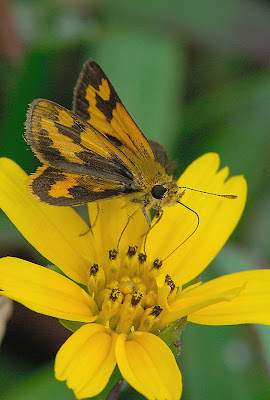 Identification of many genera of the Hesperiidae can prove extremely challenging as there are many lookalike species with obscure markings where positive identification of a species may only be possible with dissection and examination of the genitalia. A rare Yellow Chequered Lancer (Plastingia pellonia pellonia) takes a break in the shady understory in the nature reserves. 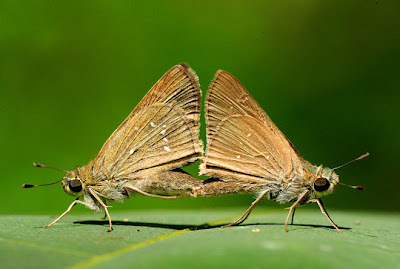 Note the typical folded forelegs, leaving the mid- and hind-legs to stand on, which Skippers often do, when at rest.